Halifax Selectmen met Tuesday, Dec. 8, and set a date for a Special Town Meeting, discussed the access road from Elm Street to the Burrage Pond Wildlife Management Area with Christopher and Thais Kasmarek, and held a dog hearing. A Special Town Meeting has been set for Monday, January 4 in the multi-purpose room of the Halifax Elementary School, 464 Plymouth Street at 7:30 p.m. The first would authorize the Council on Aging to continue funding their current plans to renovate Pope’s Tavern Senior Center, which according to Director Barbara Brenton, the Council has been outgrowing for years. The second article would ask the voters to authorize ambulance fees to be set by the Board of Selectmen, rather than at Town Meeting. This is part of Fire Chief Jason Viveiros’ plans to bring the fee structure the department charges for ambulance calls more in line with neighboring departments. Halifax is currently under-charging, according to Viveiros and the Fire Study Committee. The third article would ask the voters to simply raise the ambulance fees, should the second article not pass. If voters choose this option, Town Meeting would still have the power to vote on ambulance fees as they currently do, but this article would raise them to the proposed new level suggested by the Fire Chief. 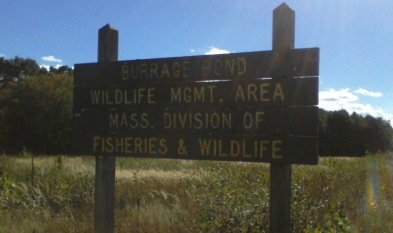 Christopher and Thais Kasmerek came before the Board to discuss issues surrounding the Burrage Pond Wildlife Management Area, now owned by the state, and ongoing issues surrounding the only access road to the site in Halifax. A controversial purchase in 2002 by the Division of Fisheries and Wildlife saw approximately 1,600 acres of land in Hanson and Halifax transferred from the Northland Cranberry Company to the Commonwealth. The intention is to use the land as a conservation area. The Kasmereks abut what was believed to be an access road off of Elm Street owned by the State. It turns out that due to a surveying error, the Kasmereks own a good portion of the access road, and have since closed it off, blocking public access to the State-owned portion. The Kasmereks said that they often invite people to park on the street or their own property to allow people to enjoy the area, but are fearful of any action that the Town or State might take to open up access again. The Division of Fisheries and Wildlife wants to build a parking lot and some sort of buffer for the Kasmereks, but they object. When the DFW took over the property, they claim that there was an uptick in “bad-behavior” behind their property, with people coming and going at all times of day and night and leaving behind beer cans, glass, needles and dog refuse. “You have to live it, you just have to live it,” Christopher Kasmerek frequently said throughout the lengthy exchange with selectmen, but remained composed but visibly frustrated. Although he never raised his voice, his controlled anger was evident. Policing of the property is now under the jurisdiction of the Environmental Police, who appear to not have the resources to cover this property. There is some dispute between the Town and the Kasmereks over the number of times the Halifax police have been called for issues at the property, but the Kasmereks did not debate the topic, stating that there were times that they were possibly referred to the Environmental Police. They claim to frequently call the police. Selectmen Chairman Kim Roy pushed for compromise, stating that things could get worse; the DFW could act on its own simply going around the Kasmerek’s property through state-owned land adjacent to the current road, joining the section of the road that they own to the street and then building the same parking lot previously proposed. “We have to solve this,” Roy said. Selectman Thomas Millias expressed his deep distrust of the Division of Fisheries and Wildlife and also pushed for a compromise. The Town will continue to work with the couple and the DFW to find a solution that works for everyone. A familiar face around Town Hall, Finance Committee member Nikki Newton appeared before the Board for a different reason: a dog hearing. Selectman Garron made the same comment he makes at almost every dog hearing, “This isn’t a dog hearing, it’s a people hearing,.” Garron, a professed animal lover, takes the hearings seriously. Animal Control Officer Noreen Callahan, in her police blue “Halifax ACO” jacket testified that Newton’s dog, while at a dog training facility in Hanson, had bitten a 20-year-old, inexperienced handler. The dog trainer had no problem accepting the dog back, and felt that it was an isolated incident. Newton agreed, as did Callahan. “Sounds innocent enough,” said Millias. The Board decided to take no action under the rationale that they usually encourage residents at dog hearings to get their dog professionally trained after an incident, but this incident happened with a dog trainer.